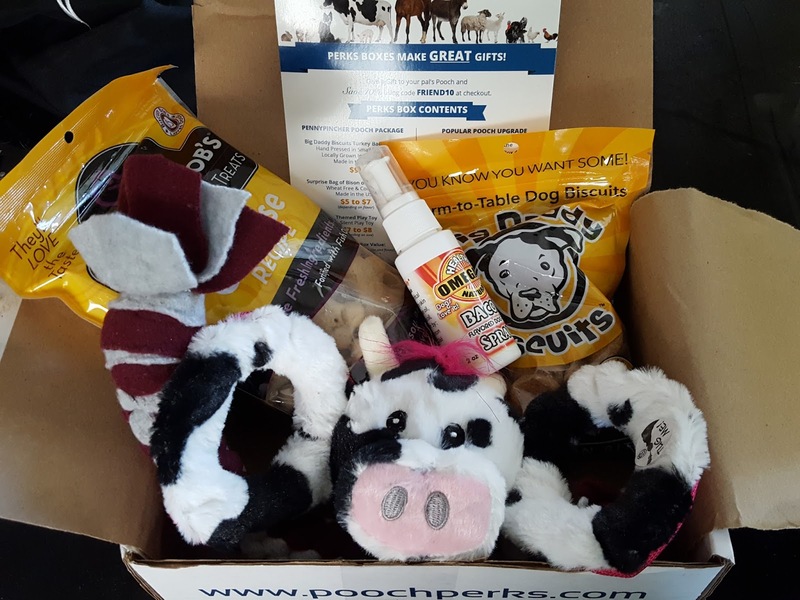 What: Pooch Perks is a subscription box for dogs filled with 2-6 treat, toy, and hygiene items. 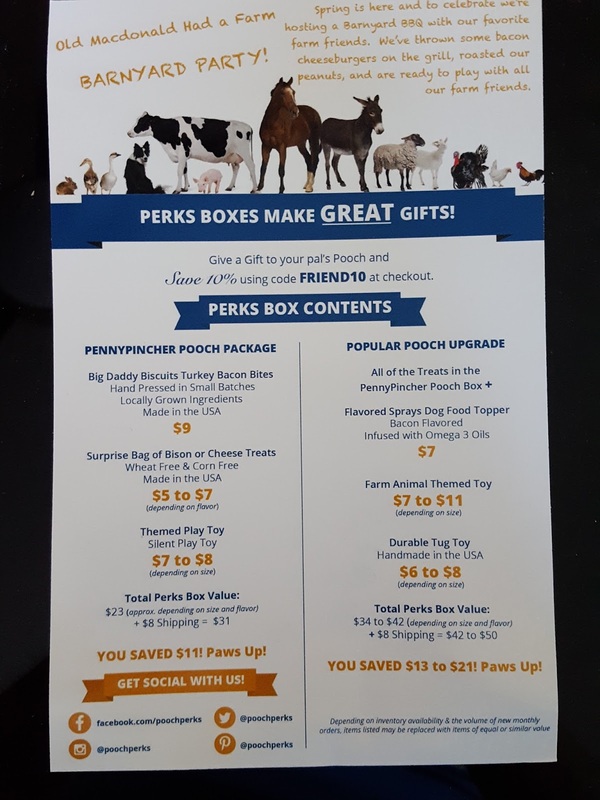 There are four subscription tiers; boxes within each tier are curated according to your dog's size. You can also make special requests (heavy chewer option, allergy-conscious, box frequency changes) when you sign up. For reference, this review is on the Popular Pooch box (4-5 items) for a medium/large dog (35lbs+). Fun Fact: Want only treats or just toys? You can sign up for that for just $20/month! Also, $1 from each box goes to rescue groups. This month 's organization is Ralph's Place. Check out their page here. 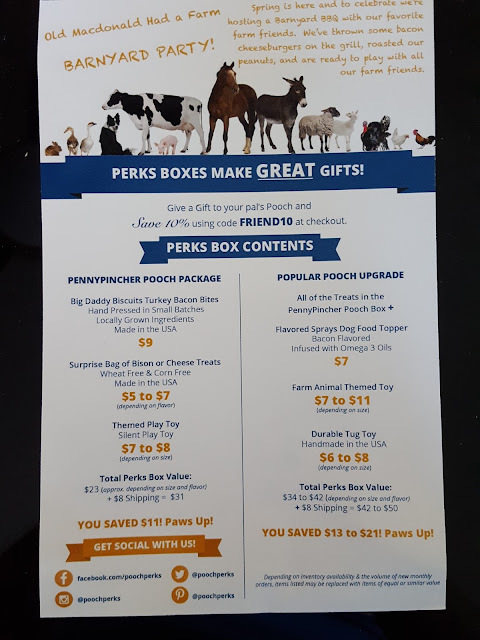 The info card is a tad confusing but basically there are four tiers of boxes: this month the smallest one (Pennypincher) has 2 treats + 1 toy; the Popular Pooch box has both treats from the smaller box + 3 non-treat items. The next two bigger boxes (on the flipside) add on an extra item so that the biggest box has 7 items total. 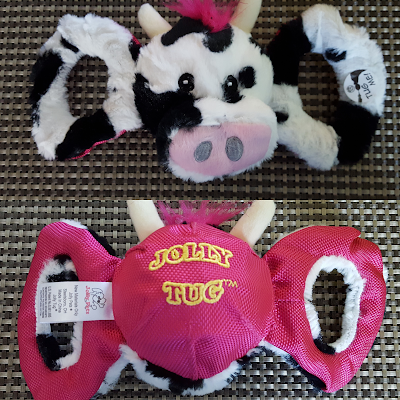 Jolly Pets Jolly Tug Cow (Value ~$11) - April's theme is Barnyard party and what better way to kick off the box than with a cow? This plush cow tug has a squeaky ball in the middle. I'm fairly certain it won't last more than a day with my dogs, but that's only because one of them thinks that no game of tug of war is complete without destroying the toy (*ahem* Pebbles). Big Daddy Biscuits Turkey Bacon Bites (7.5oz bag value: $7) - Lucky dogs. I love turkey bacon. I kind of want to go out and buy some now. The turkey bacon, not more treats. They have enough already. After getting meaty treats for so long I'm glad to finally see biscuits come my way. Yes, these will be loved. Healthy Omega3 Bacon Flavored Dog Food Spray (2oz value: $6) - If you have a picky eater just put a couple spritzes of this stuff over their food and your dog will be chowing down in no time. It smells like bacon so I'm sure no dog will turn their nose up at this. 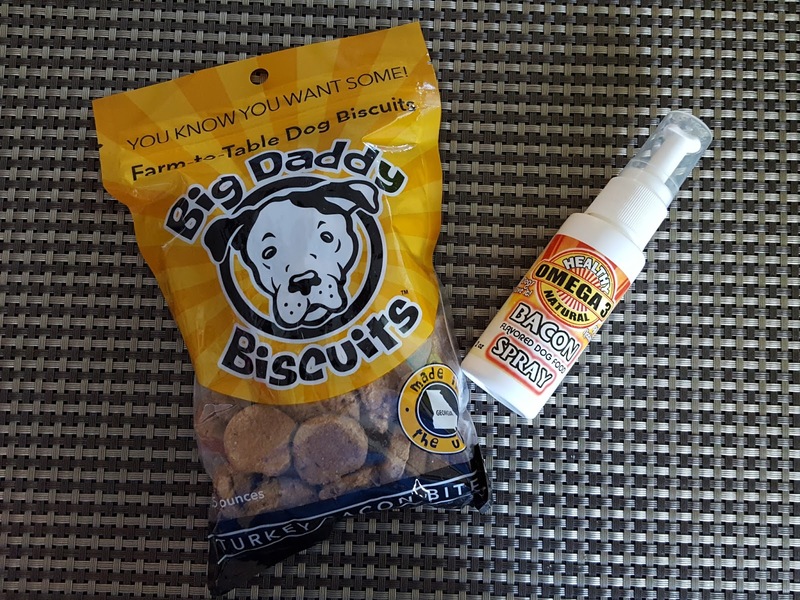 This spray is loaded with omega 3s which give your dog a nice shiny coat - it's a great alternative to keeping stinky fish treats at home. This is human grade too so if you're a picky eater as well, well...let me know how it goes. Also available in cheese, chicken, peanut butter and roast beef flavors. Fleece Rope Toy (Value: ~$5?) - Did you ever make those plastic lanyards as a kid? That's what this reminds me of. There aren't any tags on here so I don't know who made it, but you can easily make these at home without a sewing machine! Great for me because I don't own one :-/ Believe it or not, these are my dogs' favorite type of rope toys. I think it's because it's easy for them to grip the felt with their teeth versus the nylon toys. Might not last too long, though. Oh well, at least I can make them a new one! 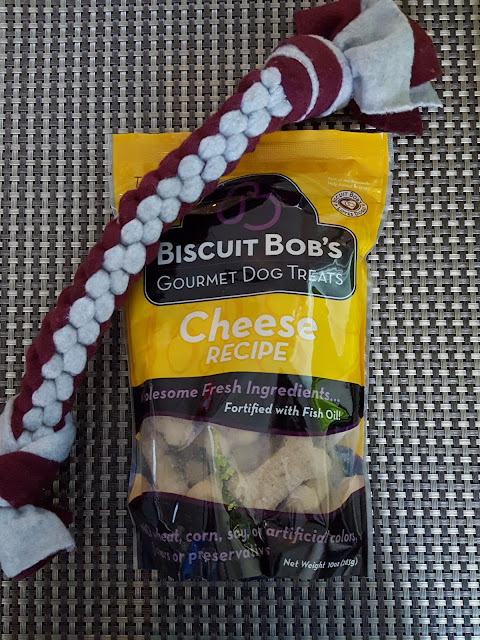 Biscuit Bob's Cheese Treats (10oz bag value: $7) - This is a hefty bag of treats. Cheese treats. 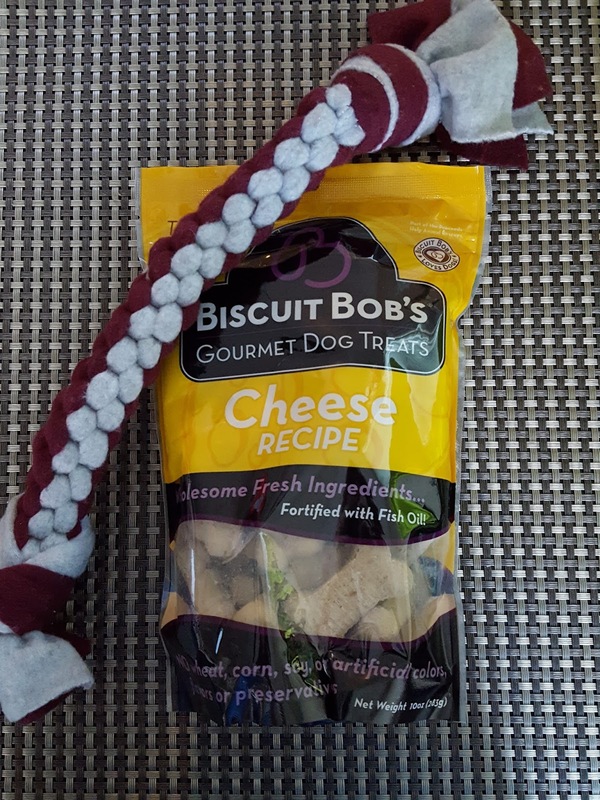 These are wheat, corn and soy free and are personally taste tested by Biscuit Bob's owner. I'm gonna mix these with the turkey bacon treats. I think the dogs should be good for the next few weeks. Until next month's box, anyway. This was my first Pooch Perks box and I'm pleased with the curation. Most of the items are good quality and I'm happy to discover a cheap way to make DIY tug toys for the little monsters! My favorite is probably the bacon spray not because my dogs are picky eaters (in fact they're the complete opposite; I should have named one of them Hoover) but because it beats keeping a bag of salmon treats in the house. Peeeyew! Want a box? Use code FRIEND10 to get 10% off your first order of any box option! Note: No referral links were used in this post. It's just me and my pups' honest opinions! I like this box!! And bacon spray?! They should make them for humans. I'd probably have eaten the cooked carrots my parents forced me to swallow a lot faster if they'd spayed bacon on them. I hate cooked carrots. If they made a human version I'd totally put it on anything and everything. Like salad. And fries. And bittermelon. *shiver* It's the only way I'll ever eat bittermelon.